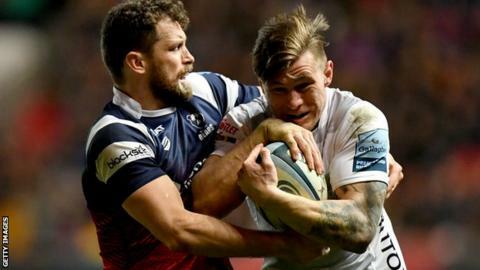 Bristol Bears ended their 11-year wait for a Premiership win over West Country rivals Gloucester, in a gripping derby. The hosts led through Dan Thomas' try after 82 seconds, but Jason Woodward responded for the visitors - with both men scoring against their former clubs. Andy Uren then went over for Bristol before quick tries from Tom Marshall and Ollie Thorley put Gloucester ahead. But a penalty try and Ian Madigan's late penalty gave Bristol a valuable win in their bid to avoid relegation. Pat Lam's side's tense win at Ashton Gate - aided by two late yellow cards for the Cherry and Whites - moved them up to ninth in the table, 13 points above bottom side Newcastle Falcons. Defeat for fourth-placed Gloucester - who had been bidding for a third straight win after impressive victories over title-chasing Exeter and Saracens - saw them miss the chance to go third. The game's decisive score came 14 minutes from time, with Bristol's driving maul powering towards the line and referee Karl Dickson awarding a penalty try. Gloucester's hopes of a late comeback were then dented by Ed Slater being sin-binned over that incident, with Woodward already in the bin for a deliberate knock-on, and their efforts were further compounded when Billy Twelvetrees uncharacteristically missed from the tee. In contrast, Madigan then kicked sweetly from a vast distance in the closing stages to secure Bristol's fifth league win of the season. The Bears had beaten Gloucester 21-13 in the Premiership Rugby Cup in November but had not enjoyed a win over their rivals in the Premiership since a 29-26 triumph at the Memorial Stadium in February 2008. "It was a great team performance. It was probably the most important result [of the season so far]. "It was based a lot on our culture. We've been waiting for the win because we've had a lot of belief in what we do. I've said many times when we've lost games that I'm excited about where this team is going. "We got off to a good start. There was still that hairy moment after half-time, but we showed the character to work through it and come through strong, against a Gloucester team that is on fire." "The players know we let an opportunity slip. The first half was really our own fault. We tried little offloads and didn't kick out, when the plan was to kick out. "In the second half we got the lead and felt we could capitalise, but then we let them back in. The yellow cards were debatable - one of those things that either go for you or do not. "But we should never have been in that position in the second half, if we'd played better in the first half. The reality is, we have to give Bristol credit." Bristol: C Piutau; Morahan, O'Conor, S Piutau (co-capt), Daniels; Sheedy, Uren; Y Thomas, Thacker, Afoa, Batley, Vui, Luatua, D Thomas, Crane (co-capt). Gloucester: Woodward; Marshall, Twelvetrees, Atkinson, Thorley; Cipriani, Heinz (capt); Hohneck, Hanson, Balmain, Slater, Mostert, Ackermann, Kriel, Morgan. Replacements: Marais, Seville, Knight, Clarke, Polledri, Braley, Williams, Banahan.